We teased PrusaControl for quite some time already and the first version is finally here. But first let me recap before I give you a download link 🙂 We are quite good at making the hardware and firmware easy to use, simplifying and distilling everything to the core and if absolutely needed we try to do the heavy lifting in the background. Let’s take a look at our unique calibration. When you assemble the printer for the first time, the printer will give you feedback on how well you did and if possible seamlessly compensate for misalignments. Tinkering is not necessary unless you love it and your OCD won’t let you print without the “Axes are perpendicular” message. But something similar still lacked in slicing software. Slic3r Prusa Edition was the first step with a great success and I am most proud when people mentioned they switched back from S3D. But Slic3r has one problem, it is rather complex and intimidating for new users. We cannot do much about this, it is its nature. And that is why PrusaControl was born. It is parallel to Slic3r PE for newcomers to 3D printing, we distil the settings down for the user and put our knowledge to the backend to get the same results. The main goal is to open an object and hit print. I started to think about the custom software because I do not know any slicer with proper settings management. 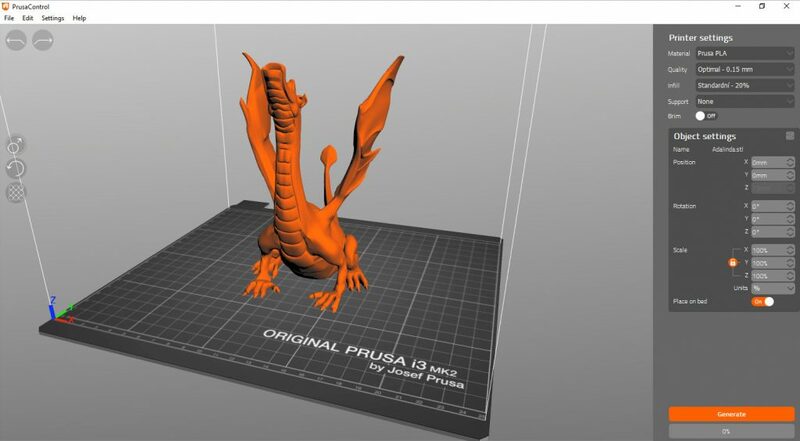 Slic3r (BTW PrusaControl is using wonderful slicing core from Slic3r PE) is close but allows people to use wrong combinations of print settings and material. Let’s say printing flexibles at an unreasonable speed. Wood composites at ultra low layer heights and so on. Just this alone will prevent a lot of tries and fails in the early phase of getting to know the printer. Auto update of the print settings is also done at each start up (internet is not required for the program to work). Then the GUI, it, of course, has to be in orange on black and very simple. At least in the first version. There are some very sweet features which are rather uncommon like Undo and Redo. Nice rotation UI is also implemented as I hated using the dialogue to type in the exact angle. Here you can rotate by 1° outside the circle and by 45° inside the circle. Our ColorPrint is also included. When you get into the simple G-code preview, you can always add a change on the highlighted layer. Very easy and convenient! Multi Material printing is not yet supported, but planned. So all in all, PrusaControl is not an “it can do all” Simplify3D alternative. Slic3r PE might turn into that. But it is easy, smart and lean slicer with perfect integration. We would greatly appreciate your feedback. There is a handy link in the help menu. Or go to our Github and add an issue. Good job, this looks awesome! Where do i go to help translate the software to Norwegian? We already have plans to buy MK2S’s for our planned makerspace, and this will make it sooo much easier to teach members who are not so old how to make a good print. Looks nice, thanks. I agree with Flor Sanders, would be nice to have advanced features. What i am missing is the amazing Layer editing! 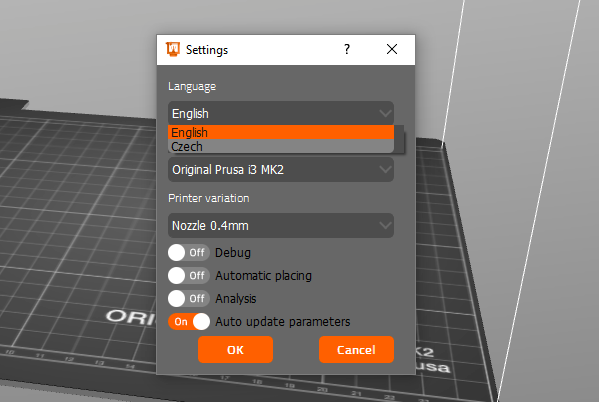 It also would be nice to get Octoprint settings in the GUI. @Flor: Many things can be predefined/customized via the printer.json and materials_i3_mk2.json, but best would be an advanced/expert mode option. 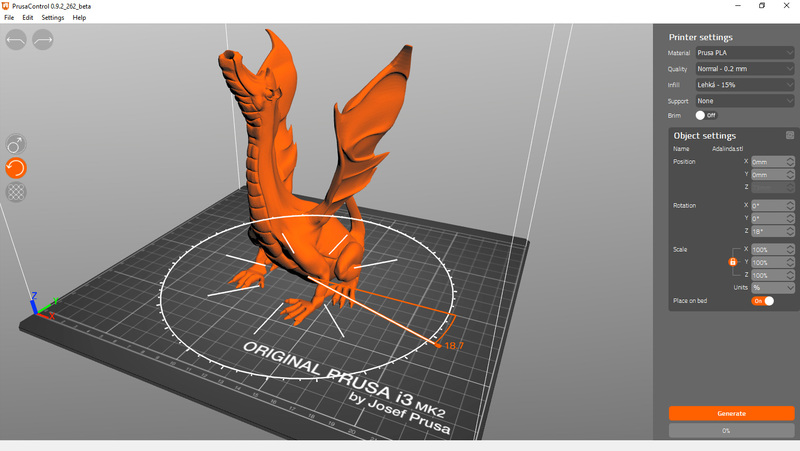 In case of any questions, please send me an email to info@prusa3d.com. Hey, I might be willing to do the French translation if needed. looks like the French is already translated (see the comment from Hexa Emails), but we would definitely appreciate if you can double check the translations as soon as it gets uploaded to our GitHub. is this just for official Prusa I3Mk2, what about Rep Rap kits? 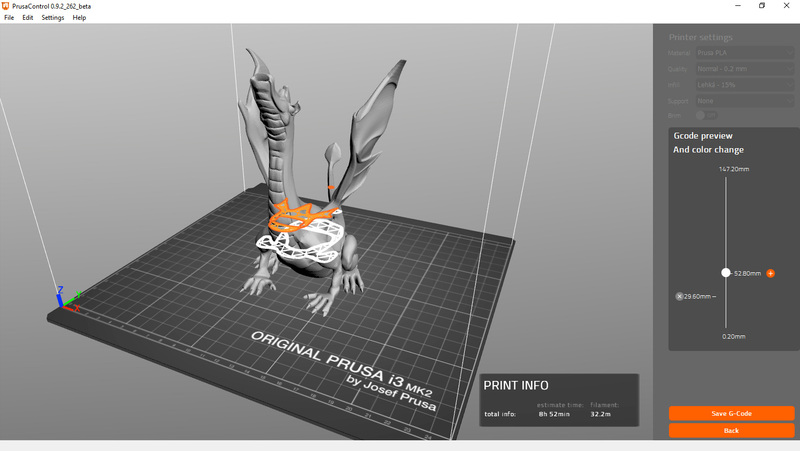 anyone know the release date for the Prusa Control Mac software ? I got problems (a lot) with Simlpify3D/Cura printing the ABS and PETG upgrades for the MK2s. Prusacontrol did the job at 1. (first) shot. Hello. Great job on the new software. I’m excited to use it. But do you know when the Mac software is coming out? Is there only the 64 bit version? Initially it was crashing at the splash screen, but one day later it started working, not sure why (likely the awful computer I’m running it on). Interface is very user friendly, I really like the colour change layer interface. Also love the estimated print time! I’m not 100% sure, as I didn’t test with slic3r prusa edition to compare (yet), but I ran into some issues printing from an stl file at draft quality. At first it was going well, but once my print got to where it needed to do infill (the infill portion was very small, probably just at the boundary of actually needing infill) the print got really messy. Almost as if there was way to much material being extruded. Hope this helps, otherwise looks like a great interface! And I just noticed the link to the github above, where I should have posted this. Doh. Ill post it there, sorry. I hope this finds you, I have an idea for you not sure f you have thought of this but if possible could you contact me on my email it might be nothing major or could be but if you willing to take the time please contact me.